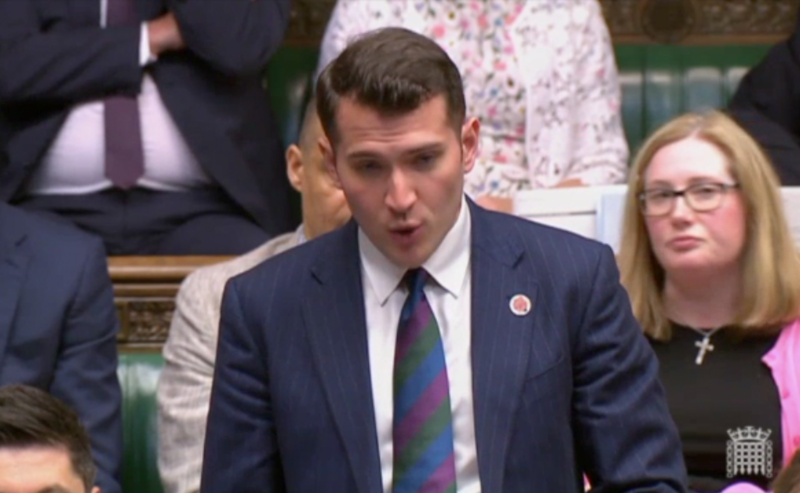 The Prime Minster made the pledge in the House of Commons today after Paul Sweeney, MP for Glasgow North East, highlighted the plight of Giorgi Kakava. 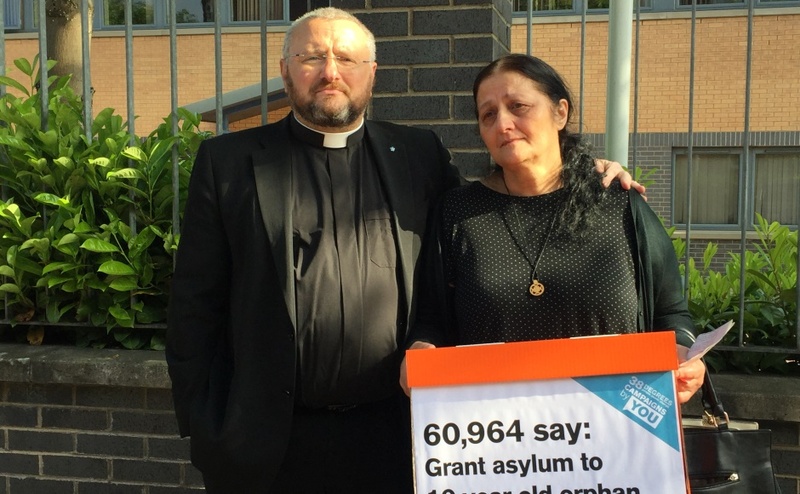 Rev Brian Casey and Ketino Baikhadze, Giorgi's grandmother, outside a Home Office building in Glasgow. The schoolboy was just three when he and his mother Sopio fled Georgia and sought asylum in Glasgow because his life was allegedly threatened by people his late father is said to have owed money to. Giorgi’s mother died in February after a long illness and his grandmother, Ketino Baikhadze, is now his legal guardian. The pair are both seeking asylum and earlier today she handed over a petition, calling for Giorgi to be allowed to stay in Glasgow, to officials at the Home Office who interviewed her. Nearly 66,000 people have backed the campaign, which was organised by Rev Brian Casey of Springburn Parish Church in Glasgow. Paul Sweeney, MP for Glasgow North East. Speaking in the House of Commons at Prime Minister's Questions, Mr Sweeney said: “My constituent Giorgi is 10 years old. “He was tragically orphaned in February. “He has lived in Glasgow since he was three years old. "His only language is English and he speaks it with the same accent as mine. In response, Mrs May said: “The Honorable Gentleman raises a very specific individual case. Home Secretary Sajid Javid affirmed he would examine the case by nodding profusely. 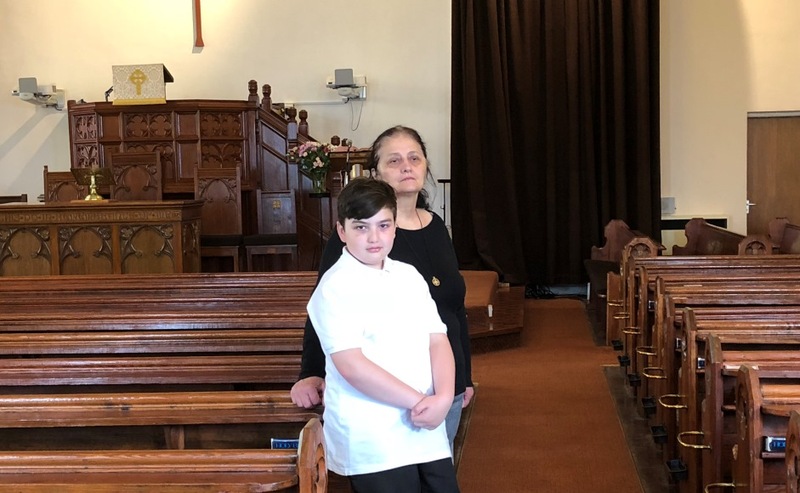 Reacting to the exchange, Mr Casey, who co-led Sopio’s funeral and is campaigning to fulfil her dying wish that Giorgi continues to grow up a Scottish boy, said: “I am very pleased that Theresa May has assured the House of Commons that the Home Office will examine Giorgi’s case. 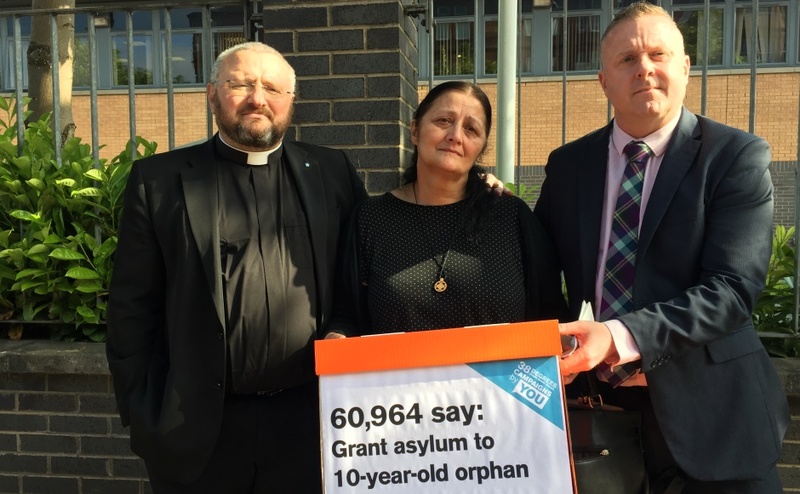 “Today, Giorgi’s grandmother, Ketino, handed over a petition with more than 60,000 signatures to Home Office officials in Glasgow, who are examining their applications for asylum. Mr Casey, who has written to the Home Secretary, said he was very grateful to the public and cross-party politicians for their support. “This is about a 10-year-old boy’s future - a case that is about humanity, compassion and decency,” he added. Scottish Green Party co=convener Patrick Harvie has publicly spoken out about the case and lodged a motion in the Scottish Parliament, which has been signed by 19 MSPs so far. Rev Brian Casey, Ketino Baikhadze and Bob Doris MSP. Bob Doris, MSP for Glasgow Maryhill and Springburn, who met Mrs Baikhadze today, is expected to raise Giorgi’s case with First Minister Nicola Sturgeon in the Scottish Parliament tomorrow. “This is another heart-breaking case of a young boy being threatened with deportation rather than treated with compassion,” he said. “Young Giorgi needs certainty, safety and stability as soon as possible and that must surely mean his future should be safeguarded here in Scotland. “The local community has rallied round to offer their support and I have written to the Home Secretary, Sajid Javid, urging compassion.